The structures for controlling arousal are located in the brain and can be demonstrated in the following example. A competitor has warmed up for the next event, yoke walk. He begins going over the event in his head, this competition is one of the biggest of the year. These thoughts lead to anxiety about his performance. His thoughts may not be realistic, but to his body that does not matter. His name is called, headphones come off, ammonia cap shoved up his nostril, and his buddy open hand slaps his back a few times knocking off all the chalk. He gets under the yoke, Judge gives the commands, “Competitor ready, Set, Go!” The competitor gets a quick start and then drops the yoke twice before finishing. Technically speaking, as he worried, messages were being sent by a quick rout to the amygdala, and another message by a longer route to the thalamus and then on to the cerebral cortex (Gorman, 2002). The amygdala, in the midbrain, reacts quickly by activating physiological responses that are associated with fear, worry, and threat; causing the adrenal medulla to pump epinephrine and norepinephrine into the blood stream (Krahenbuhl, 1975). “Fight or Flight”, sound familiar? Heart rate, blood pressure and breathing rate increase, muscles begin to tighten and blood flow is redirected to large muscle groups. The competitor was overly aroused and not in peak position to perform. The Inverted-U Hypothesis predicts that as arousal increases from drowsiness to alertness there is a progressive increase in performance efficiency. However, once arousal continues to increase beyond alertness to a state of high excitement, there is a progressive decrease in task performance (Williams 2010). Inverted-U-Hypothesis suggest that performance arousal has a balanced optimal state. An example of over arousal, the competitor who consumed two scoops of pre-workout before the event, takes fifteen minutes warming up with the implements and his IPOD so loud he cannot hear himself think. We all know this competitor and seldom do they perform to their optimum level. Most often this example is seen in competitors lacking confidence in an event. Knowing it will be a tough event, they overly “psyche themselves up” trying to gain confidence in warm ups, in turn helping them succeed in the event; more times than not, their so over aroused they are worse off than they started. Does the complexity of the movement factor into arousal level? Broadhurst showed that higher levels of arousal can be tolerated on simpler tasks before performance is decreased (Broadhurst 1957). Essentially, the complexity of the movement needs to be analyzed to determine how much arousal is optimal. Let’s compare two strongman events, deadlift and yoke walk. Which event requires the highest amount of muscle activation, amount of coordinative actions, precision and steadiness required, fine motor skills required, and duration of stimulus? Answer being, the yoke walk. Based off the research, our example of the highly aroused competitor will perform better deadlifting in that arousal state compared to a yoke walk because of the simplicity of the movement. 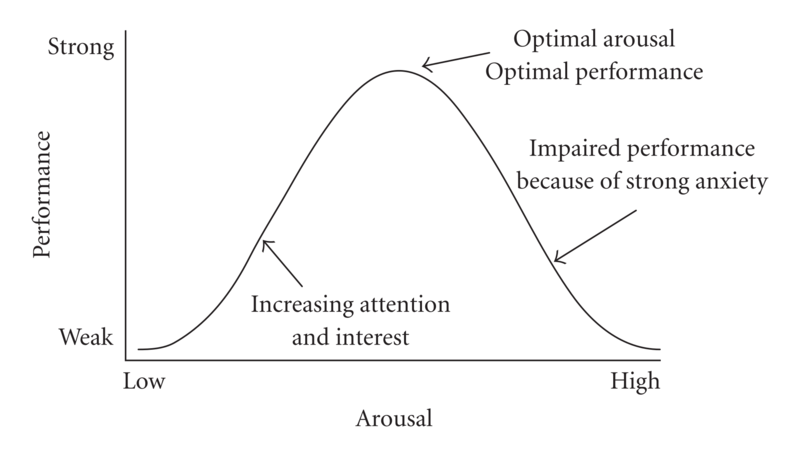 Research shows there is an optimal level of arousal for peak performance, described by the inverted-u theory. The level of arousal needed is different in each event; less complex events will allow a higher level of arousal. My next article will include techniques to regulate your arousal level and in turn, take your performance to the next level. Broadhurst, P.L. (1957). Emotionally and Yerkes-Dodson Law. Journal of Experimental Psychology, 54, 345-352. Gorman, C. (2002, June 10). The science of anxiety. Time, 47-54. Krahenbuhl, G.S. (1975). Adrenaline, arousal and sport. Journal of Sports Medicine, 3, 117-121. 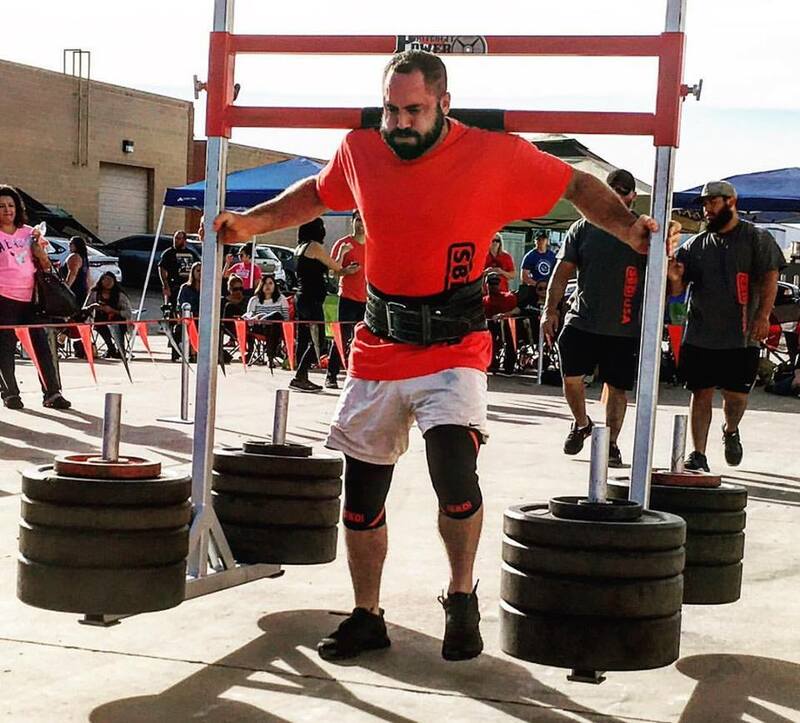 Competing in strongman for five years, Bryan Barrett won NAS Nationals in 2015 earning his Pro-Card. A two time Arnold qualifier and three time Texas Strongest Man in LW, MW and HW divisions. A High School Strength and Conditioning Coach, working on a Master’s degree in Exercise Science at UTA.